Some scandals are meant to be . . . When Aurora Hyatt loses her journal in Hyde Park, her ruin is a foregone conclusion. After all, if anyone discovers her writings, they'll find scandalous fantasies involving the newest rake in Town alongside entirely-too-candid thoughts about her typical dreary suitors. Aurora will either be forced into a loveless marriage with the first nodcock to make an offer, or she'll be assigned a permanent position on the shelf. Oh, dear good Lord. What catastrophe will God smote down upon her next? 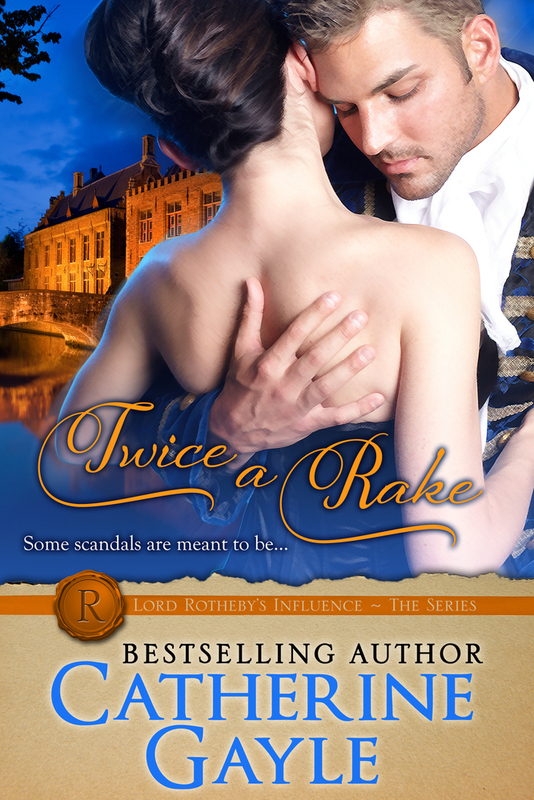 If Niles Thornton, Baron Quinton, desires to maintain any semblance of his current lifestyle, he must fulfill the requirements his grandfather, Lord Rotheby, has set for him. First and foremost: he must marry and begin filling his nursery within the year. When he is nearly barreled over by a racing curricle and a journal flies out to land at his feet, his troubles are over. Inside the journals pages, Quin discovers a scandal waiting to happen. Surely a young lady who would write such brazen things in a journal (and then dare to lose it) must recognize the necessity of a hasty marriage, even if the gentleman making the offer is rather less-than-honorable. In a drunken haze, Quin kisses Aurora on a crowded ballroom floor, necessitating their immediate marriage. Quin's troubles are only beginning, however, as Aurora's writings are soon the focus of both gossip rags and drawing room conversation. When word arrives of an even greater scandal following in his wife's wake, will he prove himself a drunken abuser like his father, or will he become the loving husband of Aurora's fantasies? Click here for the German-language translation. Oh, dear good Lord. Tonight will be another ball. While Father views it as another opportunity to find a gentleman who might make an acceptable match, I view it simply as a means to obtain the newest gossip. Rebecca promises she will have something worth my while when she arrives—something involving a reclusive, and potentially rakish, new gentleman. I can only hope he is something worth writing about. At present, the subjects for my journal entries are rather slim. Or boring. Or both. Neither her father nor her aunt could hold Aurora to task for Lord Dodsworth’s demise, however, despite the manner in which she had celebrated her freedom from impending marital doom. The earl had been stricken in years (to the point of being more than twice her age—even older than Father himself) when his face had landed squarely in his bowl of porridge. On that equally horrid and delightful morning only a fortnight before their planned wedding day, bits of gruel had spattered on both his balding head and the worn, royal blue superfine of his overcoat. How could a girl—for that is what Aurora must truly have been considered at the time, having not yet reached her majority—have been enamored of the prospect of a lifetime spent beside a man more akin in age and temperament to her father than to the beaux of her friends? Regardless of the degree of sheer and utter relief she had felt over the untimely passing of her betrothed, Aurora had been absolved in the matter. Various other matters, however…well, truth be told, a touch of blame may rest upon her shoulders from time to time. She preferred not to think on them overmuch. Certainly, the present did not provide an opportune moment for such reflection. As her father’s crested carriage drew before Southmont Manor, she bit the inside of her lower lip in order to refrain from telling her aunt just how fortunate it was that she had not married Dodsworth. Indeed, she would not have done, if given the choice. Thankfully, soon after his death, she reached her majority and earned the right to choose for herself. The coachman came around and set down the steps, handing first her aunt and then Aurora down from the carriage. After making their way through the receiving line, Aurora slunk away from her aunt to find someone more pleasant with whom to converse. Just then, her dearest and most especial friend dashed to her side, skirting through the lines of dancers, pots of flowers, and tables filled with drink, all in their proper and precise places for this particular ball. A pirate, now, was he? Aurora’s imagination took over without her full consent, painting an image in her head of a swashbuckling hero, with long black hair whipping about an unshaved jaw, black eyes with just a hint of a devilish gleam over a knowing smirk, and etched muscles of a perfectly sculpted frame threatening to burst free from the clothing that kept them confined. And just like that, the image fizzled out from beneath her like the smatterings of fireworks at Vauxhall smoldering and settling from the sky. Sun-kissed hair? Surely he must be too—too—well, too pretty to fit her dream of a dark and dangerous pirate, swaggering his way to sweep her up onto his ship and away from the more lamentable reality of the marriage mart and the depressing conversation and thebeau monde. Why, indeed? The more Aurora learned about this elusive Lord Quinton, the more she desired to know. And anyone who knew Aurora Hyatt remotely well at all could attest that if she desired something, she found it. Even if only in her imagination. Which, at the moment, was burning to be set free. Highly irritating, that. She needed details. Ample details. “Since they seem to be so knowledgeable on the subject of this enigmatic Lord Quinton, what do they have to say about his sudden appearance?” In all the Seasons she had spent in Town, never once had Aurora ever heard mention of a Lord Quinton—not even in terms of his participation in the Lords. It was possible, she conceded, that he was merely heir to a greater title, so wouldn’t have taken up his seat in Parliament yet. But Aurora needed to know. Her general need-to-know grew more insatiable with each suitor’s dismal attempt to woo her favor. It was pathetic, really. Her curiosity was like the cat that returned to chase the fish in a pond, even after having fallen in countless times. “Is that so?” Aurora mused aloud. Despite Lady Fitz-Henry’s certainty, Aurora held tight to her doubts on that particular claim. The old marchioness was the busiest of all the dragons in the ton, and frankly was certain that nearly every gentleman she came across was a rakehell or worse. For that matter, nearly every young lady’s name she mentioned must clearly be a wanton, destined to become Haymarket ware if not, in some other manner, ruined beyond repair. Except, of course, Lady Rebecca Grantham. Somehow, Rebecca had finagled herself into the position of favorite amongst virtually all of society’s matrons. They treated her almost as a pet. Which, at the moment, was proving to be most useful to Aurora. Of course, Aurora already knew more about that than Rebecca did. The man had reputedly requested (and had been indubitably denied) an introduction to no fewer than six debutantes at the Bythewood ball, in all their varying shades of pastels. “Indeed!” Now that was new information if Aurora had ever heard it. And quite the scandalous bit of it, as well. He just might actually be the scoundrel the gossips of the ton would have all the unmarried innocents believe. Scandalous enough, even, to set her mind to work. Oh, dear good Lord. She could feel the story brewing in her mind already, and she most certainly was not in an appropriate place for such an occurrence. The regrettable shade of Lord Quinton’s hair no longer mattered, since far more intriguing elements of his character had floated to the surface. Quashing her imagination, at least until she returned home and could set quill to parchment, became of dire import. Especially since she could feel herself flushing, imagining Lord Quinton making just such a statement about her own décolletage. That part would most emphatically have to be written. There was nothing else to be done for it. “Poppycock. Doing what?” Goodness, she couldn’t even convince herself with such a pitiful excuse for a denial. This story must have an even firmer hold on her than usual. Clearly, Rebecca remained unconvinced as well. Her creased brow indicated she would suffer none of Aurora’s cheek. “Most decidedly so.” Aurora couldn’t stop the shudder that coursed through her body. Lord Ilbury’s story was drab and tedious and somber—much like the man himself. And as with all of Aurora’s previous suitors, since the story depicted what their lives together would undoubtedly entail, she had seen no reason to further entertain Lord Ilbury’s attentions once she had the picture mapped out in its entirety in her journal. She could not bear the thought of such a marriage. It would be altogether too much like the marriage her parents had lived. Unhappy. Loveless. Insipid. Utterly and totally calamitous. Such would never be Aurora’s fate. Not even if she lived to be an old maid, forever alone. Being alone scared her far less than being trapped in a marriage so sad and so wrong. She need not fear for her own provision, after all. Aurora would become Viscountess Hyatt suo jureafter her father passed, inheriting all of his properties and his fortune as well. She would never want for anything. For that one small favor, she was very thankful, indeed, that Queen Elizabeth had been a bit eccentric in the way she handled her affairs. Still, even though Aurora needn’t take a husband, some small part of her wanted one. Just not thewrong one. A tiny voice at the back of her mind screamed that Lord Quinton was most egregiously and odiously the wrong one. But a much louder voice at the forefront of her mind had already set to work, plotting out how exciting their lives would be once they were together. Gracious. Deciding which of those two voices to obey might be the death of her. Quin groaned at the throb building behind his eyes and pulled the counterpane up higher. It couldn’t be noon yet. There was no call for him to be out of bed. Or for his friend to be barging in on him when he was clearly still recovering from a rather unproductive evening about Town, followed by a stop at a lovely tavern where he had proceeded to spend a touch more coin than he had intended on whiskey and women, and perhaps on a mite of gambling. Much like he had always done. Niles Thornton, Baron Quinton was nothing if not predictable. He followed the pattern laid out before him by his father, to the point that he’d now perfected it. In answer, Jonas stripped the bedclothes from the bed, dragging Quin off with them. Quin landed with a loud thud on the floor. “Christ, what do you want?” he bellowed. Every inch of his backside now burned like the clap, somewhat diminishing the pain in his head. But only somewhat. “You. Up. Now.” Jonas bit the words off then left, dragging the bedding behind. Blast. He’d either have to get up or catch his death from the cold. Quin stumbled to his feet, steadying himself at the bureau before taking a fleeting glance in the mirror. Two days’ worth of stubble. Not too bad. He could go another day or two before dealing with that. His eyes were as red as that vixen’s dress, though. What was her name, again? Lady Kingston? Lady Kennelly? All he could remember her as was Lady Kiss-Me-Down-There, with a bosom designed to send men directly to either heaven or hell. Quin didn’t particularly care which one he was sent to, either, just as long as he could bury himself inside her for a bit. And it had been heaven. At least it had been heaven until Lord Kiss-Me-Down-There walked into Bythewood’s library and found him kissing her down there. Then it had most decidedly turned to hell. Which might explain the swelling he’d just discovered over his rather blood-shot eye. Had her husband hit him? He couldn’t quite remember. Everything became a bit muddled after the heavenly bit. Enough with wondering what happened. If it was truly important, someone would remind him. In fact, Jonas might just be preparing to do precisely that. Quin pulled on a pair of breeches and did up enough of the buttons to keep the flap in place, then grabbed his overcoat from the previous evening, shrugging it on as he left the chamber to join his friend in the study. The doors had been left open, so Quin didn’t bother with knocking. A few platters of meats and baked eggs were laid out by the window, but the smell of them sent his stomach to churning. Instead, he went to the sideboard and poured himself a brandy. “A little early for that, don’t you think?” Jonas called out. He sat behind his desk, reading some missive or another. Good God, it was too early in the day to be reading missives. It was never too early for a brandy, though. In response, Quin downed it in one swill, then poured another. “Would you care to inform me what is so imperative that my presence is required at this ungodly hour?” Quin’s voice sounded rough even to his own ears, making his tone even surlier than he had intended. Kiss-Me-Down-There had a distinctly more appealing ring, though. Jonas always had to go and ruin the fun, didn’t he? Quin shot up from his chair and paced. “From this bloody nonsense Rotheby has set for me!” Well. Blast. That wasn’t quite the way Quin had intended to go about all of this. Jonas raised an eyebrow but withheld his questions. “Your grandfather threatened you. His heir.” The baronet had perfected the art of the dubious expression. Didn’t he know it? “Any suggestions?” Quin drawled. No surprise there. Jonas may be his best friend, but he was never slow to tell Quin when he needed to change his ways. Which was often. Almost perpetually. “Noted.” He could easily find a whore or two willing to slake his needs. In fact, he might have already done just that last night. Damned if he could remember them though. “So you have to change your ways. Present a good image. Play the part.” A cheeky grin spread wide across Jonas’s face. “Meaning what, precisely?” Quin wished he hadn’t asked. He didn’t want to know. “You’re joking,” Quin said. He liked having his hair long. He hated shaving. And he bloody well could not abide the thought of primping himself like a blasted dandy. “What, pray tell, might that be?” Quin asked, unable to hide the droll tone.